Map of Galle by Adriaen de Leeuw, 1659, about improvements to the defences of Galle. The construction (nieuw werck) under way in 1659 is thought to be the New Point (nieuwe puntje) of 1663. Guards here and at Flagpole Point prevented looting of the shipwrecked Dolfijn. Similar redrawn map. The maintenance of the fleet and crew was among the major concerns of the VOC's directors, both in the Netherlands and Batavia. In the early 17th century, most ships made a round trip to Asia without much opportunity for proper maintenance. When the VOC set up an Asian headquarters in Batavia, it also established a permanent facility for repairs. In every ship sailing to Batavia the VOC sent large quantities of spare parts and maintenance products, such as masts, sails, nails and tar. To use the ships as efficiently as possible, the directors in Batavia introduced a system of annual inspections. Ships in good condition were allowed to make the trip to Europe, ships in moderate condition could serve on the China-Japan and India-Arabia routes, and ships in poor condition could go only on short trips to the Spice Islands. Despite these improvements in maintenance and monitoring, ships continued to be left behind or wrecked due to the unseaworthy state of the ship and/or crew. We have an example in Galle harbour: the yacht Dolfijn. The Dolfijn sailed from Surat for Batavia on 29th April 1663, after loading yams and letters. Shortly after sailing, the ship was found to be leaking badly. Even with two pumps the crew were unable to keep her dry, and they returned to harbour. 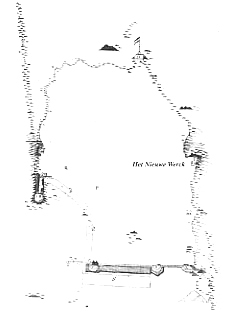 The skipper, chief boatswain and constable's mate all went below to inspect the ship, and found the leak in the powder magazine on the port side. The powder was unloaded, and the carpenter repaired the leak. On 30th April the Dolfijn sailed for the second time. When they were passing 'het Hoogelant van St. Jan' (St John's highland or headland), the ship was strained by heavy seas. Again the crew had to pump day and night to keep her dry. On 3rd May the skipper discussed their difficult situation in the 'scheepsraad' (council of officers). On arriving at a VOC post on the Indian coast, the Dolfijn asked for assistance from a merchant by the name of Zandtvliet. The Dolfijn requested 20 to 25 local men to pump the vessel in case of emergency. The locals however asked too high a price: one pagood (local currency) per month, free water, firewood, and rice, plus the use of a galley, and six months' pay in advance. So the ship left without assistance, but with 32 packets of opium for Cochin. The Dolfijn arrived there on 10th May, 'lek maar behouden' (leaking but safe). Once again a request for assistance was turned down. The ship was told to sail on to Galle, and her problems intensified. On 14th May the ship was at 6' 10" North in bad weather when the leak became worse. In order not to miss the difficult entrance to the Bay of Galle, the skipper decided to anchor in thirteen fathoms. To keep the ship dry, the crew deployed a fourth and a fifth pump. When the time came to sail, the crew were so exhausted after constant pumping that they were unable to lift the anchor, and cut the rope. The Dolfijn sailed to the entrance of the bay, where they anchored, and fired several guns as distress signals. The situation became untenable, since even five pumps were not enough to keep the ship afloat and buckets were also needed. The only sensible course of action was to sail the ship into the bay as quickly as possible in order to save the crew, money and cargo. Again there was a problem in lifting the anchor, because the crew were either fully occupied with pumping or were completely exhausted. Another problem arose when the pilot came on board. He explained that it was impossible to enter the bay because the ship was lying directly in front of a shallow reef and the wind was not favourable. Aware of the seriousness of the situation, the VOC sent help from the shore, but by the evening the ship had to be abandoned, since water was already lapping the galleries at the side of the cabin. An eye-witness account of the disaster was found in the diary of Adriaan van der Meijden, who was a high VOC official in Galle at that time. By the following day, only the tops of the masts could be seen above water. The Dolfijn may have been relocated using remote sensing devices. A future survey should reveal the state of the wreck.